We at Osage Audio Products, the makers of Audio Intelligent Vinyl Solutions record cleaning products, endorse the use of Clearaudio record cleaning machines, and we now also sell them. 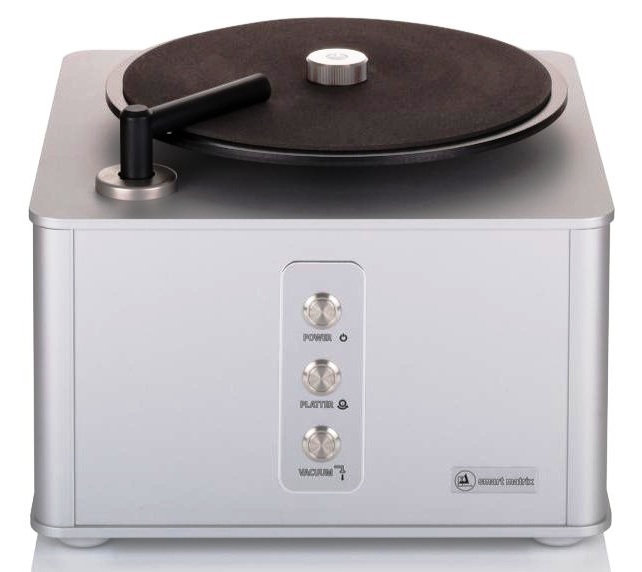 In addition to the Clearaudio record cleaning machines, we offer high value packages that include a selection of Audio Intelligent Vinyl Solutions products as well as options for record cleaning brushes and record sleeves. Please see the listings below for details of this money-saving program. Custom packages are also available. Call or email us with your needs to build a custom package. Clearaudio record cleaning machines carry forward in the fine tradition of German manufacturing quality. From the appearance of the casework to the finish and manufacturing tolerances of the smallest parts, a Clearaudio record cleaning machine speaks quality. The proven operation design dries the record quickly and thoroughly without excess venturi effect at the pickup orifice. This is important for having the dirty cleaning fluid removed from the record rather than having it dried on the record as some machines can do. A Clearaudio record cleaning machine is an investment in your record collection and in better sound reproduction. Built in-house by the professional machine builders at Clearaudio, the Smart Matrix Professional features bi-directional platter rotation, vacuum noise that is around 20 decibels lower than the previous model, and improved ease of operation. The vacuum turbine and the gear reduction motor used in the Smart Matrix Professional are the same ultra-heavy-duty models that are used in the industry-leading Double Matrix Professional. The chassis and casework of the Smart Matrix Professional are extremely rigid and highly damped. This reduces the noise and the vibrational energy produced by the operation of the machine and also guarantees long machine life. A clear acrylic lift-off dust cover is included. Click here to download the Smart Matrix Professional User Manual. 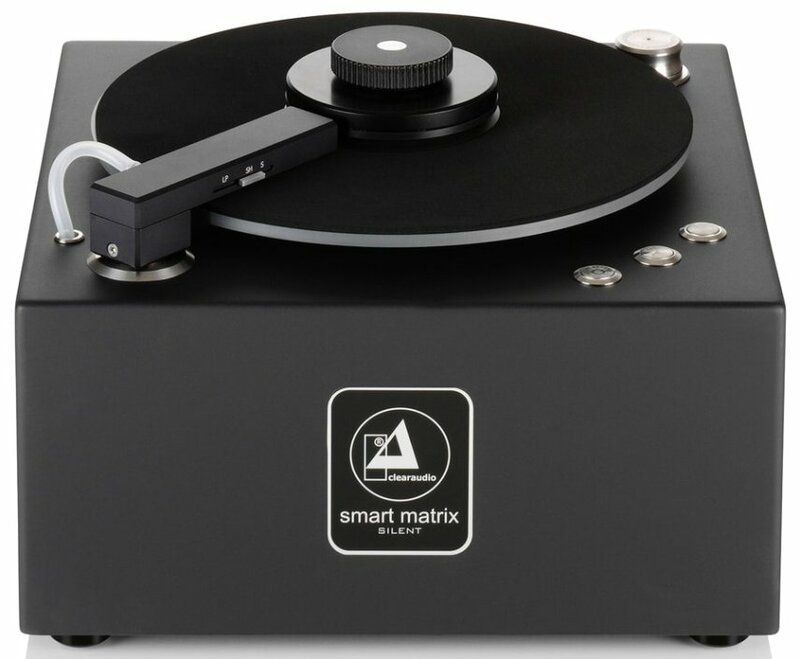 The latest advancement in record cleaning by the engineers and artisans at Clearaudio, the Smart Matrix Silent is the quietest vacuum record cleaning machine on the market. But that’s not all – it is also loaded with convenient adjustability and automated features. The Smart Matrix Silent features a heavy duty vacuum pump and motor like those in the top of the line Clearaudio model, as well as a super rigid cabinet and a host of automated and convenient features. 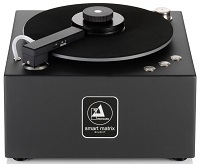 Those include automatic start when the wand is moved into place, a dual-purpose wand that is adjustable for 7, 10, and 12 inch records, selectable automatic fluid dispensing, record clamp that includes adapter for 7 inch 45RPM records, bi-rotational platter, and push button controls. The features make cleaning any size record quick and easy with no need to change any parts on the machine. The selectable automatic fluid dispensing feature allows for easy switching among single step and multi step cleaning systems. A clear acrylic lift-off dust cover is included. 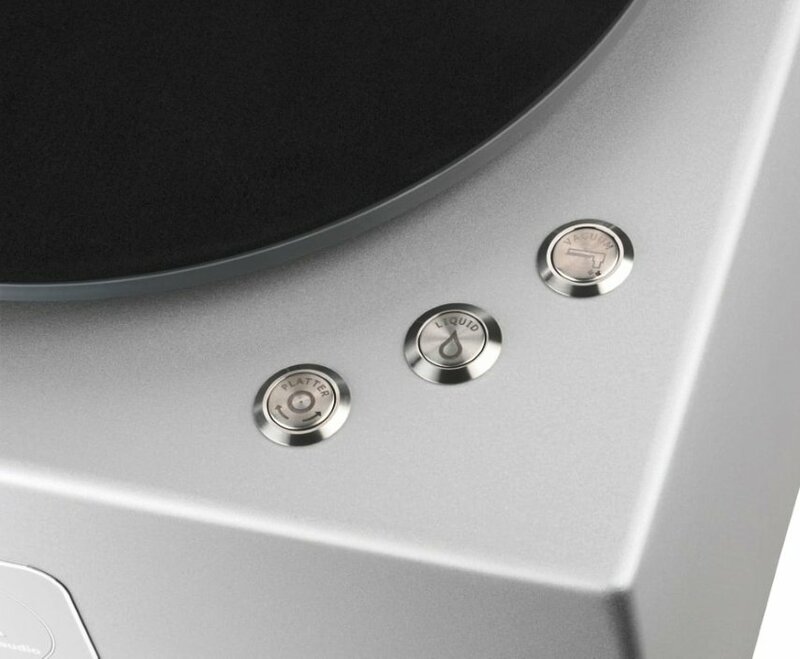 The Smart Matrix Silent is available in your choice of silver or black. Click here to download the Smart Matrix Silent User Manual. 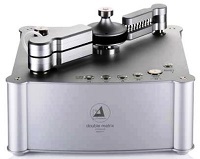 Clearaudio has created a new articulating washing and vacuuming system for cleaning phonograph records that incorporates sonic vibrations to more efficiently and thoroughly remove contaminants from the record groove. 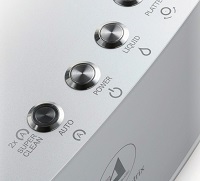 Clearaudio has conducted exhaustive research which has confirmed that the sonic agitation system of the Double Matrix Professional Sonic outperforms ultrasonic cleaning machines, and does so with no risk of damage to the record that is inherent when using a cleaning system that is designed for use on hard materials such as jewelry, metal, and glass. The Double Matrix Professional Sonic system automatically adapts to different thicknesses of records, assuring better performance and ease of use. The sonically articulating cleaning pads can be easily removed for washing as well as replacing the micro-felt strips. This machine features double sided cleaning, automatic application of cleaning fluids, and fully automatic operation, allowing the user to place the record on the machine, select one of two fully automatic cleaning modes, and walk away. 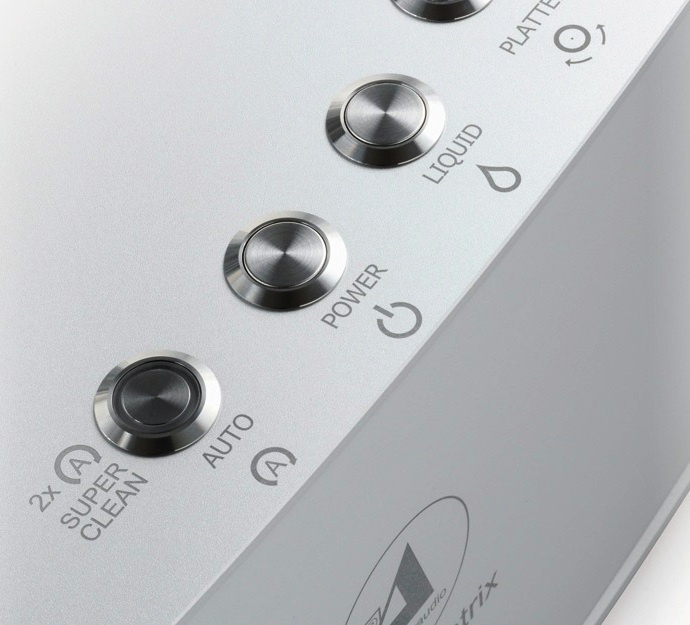 The Double Matrix Professional Sonic applies the fluid, agitates it on the record bi-directionally, and vacuums the record dry, all at the touch of a button. Clear acrylic dust cover and replacement vacuum pickup wand pads sold separately below. Click here to download the Double Matrix Professional Sonic User Manual. Note: To download or view Clearaudio product owner’s manuals, go to the Clearaudio Electronic GmbH website select English on the left border of the webpage, and then select “Download/ Tests” to go to the links page for the manuals. Clearaudio offers a wide range of accessory products to make the record cleaning process less burdensome and more rewarding. You’ve made the investment in your record collection; now protect it with one of these smart clear acrylic dustcovers. Available for 7 inch and 10 inch records. Please specify when ordering. Pickup wand pads should be checked frequently and replaced when they begin to show wear. Please specify the machine model and pickup wand size when ordering. Please specify the size needed when ordering. Designed for use with the Clearaudio Smart Matrix Professional record cleaning machine, a spindle adapter is also included which allows the use of the Seal Professional with every current and past Clearaudio record cleaning machine. And it is more effective on those past models than the clamps that were sold for those machines since the Seal Professional seals the record label completely against moisture damage and firmly holds the record in place while cleaning. The Seal Professional is an upgrade for all Clearaudio record cleaning machines. Very similar in design to the Matrix integral brush. Uses a micro fiber pad and can be used for dry dusting as well. This is the direct replacement for the brush included with the Smart Matrix model. Fitted with two rows of thin carbon fiber bristles. When used properly, it will remove dust and reduce static charge on the record.